The Climate Summit in Paris began with calls from Heads State and CEOs of companies tor Carbon Pricing. One can say, after Paris there is no longer any doubt about the climate problem and the importance of carbon trading. The summit ended with two surprises: 1) the nations want to keep temperature rise well below below 2 Degrees, but maybe even below 1.5 degrees and 2) nations will rely on a robust carbon market. There is a clear link between ambitious climate objectives and a well-functioning carbon market. We see this in the EU. The EU ETS ensures that the agreed targets are met. What should be done is to prepare the carbon market for sharper long-term CO2 targets. What did the Paris Agreement say about it and what is different than in the Kyoto Protocol? Being in Paris for Environmental Defense Fund, I can give the assessment of the outcome as I saw it developing. There are more similarities than one would see at first sight. 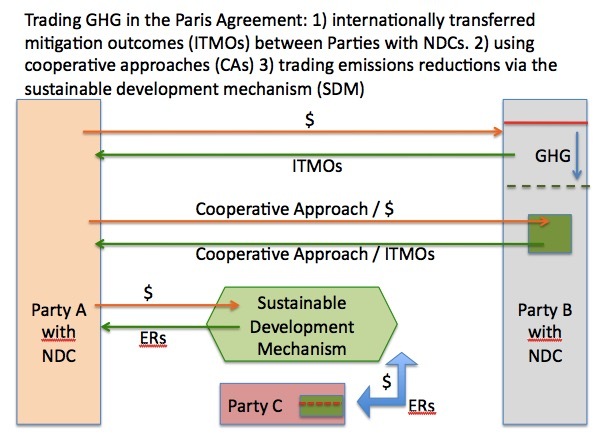 Like in the Kyoto Protocol there are three types of carbon trading between countries and for companies; see also my Table with relevant Agreement and Decision paragraphs. Trade in reductions through the Sustainable Development Mechanism. The successor to the Clean Development Mechanism. The difference is that the SDM should result in global (net) reductions; CDM has only led to a shift of total emissions. In all three above types environmental integrity should be ensured and double counting of emission reductions should be avoided. Paris also decided that the new Ad Hoc Working Group on the Paris Agreement (APA) will make guidelines for the market mechanisms. New Zealand announced in a Ministerial Decalaration some sort of Carbon Club with 18 participation from US , Germany and The Netherlands and from South Korea to Indonesia and Chile, to cooperate on the elaboration of robust market rules (see for the full list of countries the Declaration). The UNFCCC can later incorporate those rules. 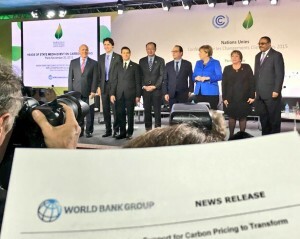 Related to this work is the announced G7 Platform on Carbon Pricing and the Carbon Pricing Leadership of which the 2016 meeting is hosted by The Netherlands. 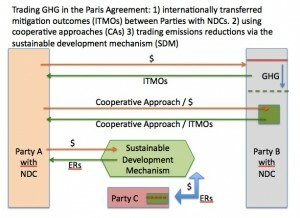 For the EU, Paris means that its emissions trading system, after the upcoming link with Switzerland, can connect more easily with countries that also have CO2 obligations asd cap-and-trade systems in place. Depending on the implementation of the SDM, the EU may use also these credits to increase the CO2 2030 target. The change of government in Canada, and Mexico, preparing a CO2 trading system, makes it conceivable that a North American CO2 market will be established; Hillary Clinton called for that. That would make a link between emissions markets in California and other states easier, as well as a link with the EU ETS. There are more similarities between the Kyoto carbon market and the Paris carbon market than one would see at first sight. Carbon trading skeptics thought that carbon trading would disappear, but it has become just more firmly anchored. The reason? It is for governments an effective system to meet agreed emissions targets. And the carbon market can achieve early and additional CO2 reductions and certify them to use for future sharper emissions targets. And carbon trading systems improves international level playing field for businesses. Because the Nationally Determined Contributions will be tightened every five years, the carbon market can anticipate to this. In the second half of this century, global emissions must balance the reductions. That means the North will have to reduce more emissions than they emit! That requires the use of the global carbon market, cause reductions shaped come from abroad, It is also important that the CO2 reduction of forest protection (includes ‘REDD’) is included; that can create net reductions. It can generate early billions of tons of CO2 reduction yearly, if you can certify it to secure it and to give it a value. In comments it is noted that aviation and shipping is kept off the hook. That is not entirely correct. The emissions from these sectors fall under the global CO2 target. But the cross border nature of these emissions makes it more difficult to agree on measures. ICAO (UN aviation organization) is now working on that; at the Assembly in May 2016 ICAO will decide on a Market-Based Mechanism to meet the target of ’emissions neutral growth’ and can then make use of the carbon market agreements in the Paris Agreement. The same is possible for IMO (UN maritime organization).